Linux Bible, 9th Edition is the ultimate hands-on Linux user guide, whether you're a true beginner or a more advanced user navigating recent changes. This updated ninth edition covers the latest versions of Red Hat Enterprise Linux 7 (RHEL 7), Fedora 21, and Ubuntu 14.04 LTS, and includes new information on cloud computing and development with guidance on Openstack and Cloudforms. With a focus on RHEL 7, this practical guide gets you up to speed quickly on the new enhancements for enterprise-quality file systems, the new boot process and services management, firewalld, and the GNOME 3 desktop. Written by a Red Hat expert, this book provides the clear explanations and step-by-step instructions that demystify Linux and bring the new features seamlessly into your workflow. 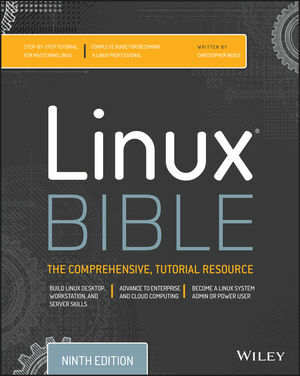 Linux Bible, 9th Edition is the one resource you need, and provides the hands-on training that gets you on track in a flash. Christopher Negus has been teaching and writing about Linux and UNIX for more than 25 years. He is an instructor and principal technical writer for Red Hat, Inc., and the author of dozens of Linux and UNIX books, including Red Hat Linux Bible (all editions), CentOS Bible, Fedora Bible, Ubuntu Linux Toolbox, Linux Troubleshooting Bible, Linux Toys, and Linux Toys II.